There are three drivers influencing cost of production today; facilities, weaned pigs and feed, with feed cost accounting for over 50% of the total cost of production. Thus, producers should be focused on either reducing feed cost or improving whole herd feed efficiency. Feed efficiency is typically measured by feed consumed per unit of gain and has a major effect on producers’ profitability with its strong association with feed costs. There are different measures that can affect feed efficiency, a few of those include feed form, feed quality, nutrient density, health and ractopamine. Particle size reduction has a big impact on feed efficiency. Reduction in particle size of feed ingredients, corn in particular, increases the surface area of the grain and improves digestibility. Research has shown that feed efficiency improves by 1% for every 100 micron reduction in particle size. However, too fine of a grind can increase feed processing cost, and reduce feed flowability which can cause out-of-feed events and an increased chance of gastric ulcers. One important on-farm factor that can be controlled by producers is feeder adjustment. 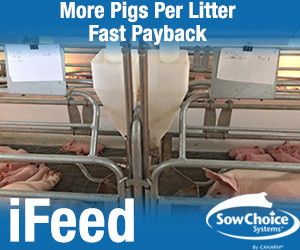 Feed wastage has a large impact on feed cost and feed efficiency. 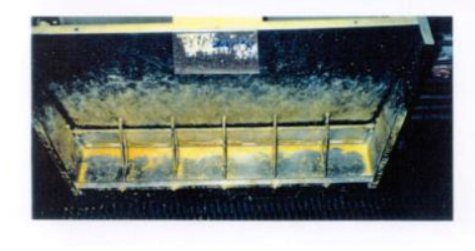 It’s recommended to have 60% pan coverage in the nursery and 40% pan coverage in the finisher, without feed accumulating in the corners. On the left is a proper feed adjustment and on the right is an improperly adjusted feeder. Improving nutrient density of the diet can also improve feed efficiency. One way of achieving this is by feeding a higher energy diet (increased fat). When increasing fat in the diet by 1% you can generally expect to see a 2% improvement in feed efficiency, which is similar to what we have observed in our energy trials conducted at our commercial nutrition research facility. It is important that the diet is also adequate in amino acid ratios, as diets deficient in lysine can influence feed efficiency as well. 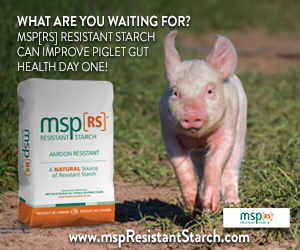 Pig health has a big impact on almost all aspects of swine productivity and is an important factor affecting feed conversion outside of nutritional influence. Disease challenged pigs aren’t able to utilize nutrients for growth, but rather to fight disease. In general, for every 1% increase in mortality, feed efficiency will be reduced by 0.5% to 0.8%. Ractopamine (Paylean/Engain) is a widely used feed additive in the swine industry to help improve feed conversion and carcass composition (lean gain). The effect of feeding RAC is seen almost immediately within the first 7 days and is most effective when fed no longer than four weeks. It’s important to avoid a long duration of feeding because of the diminished response and loss of benefits. This improvement in feed efficiency isn’t contributed to reduction in feed intake, but feed utilization, which is why it’s important diets are adjusted when fed RAC. Packer metrics may also be considered when evaluating the use of RAC. 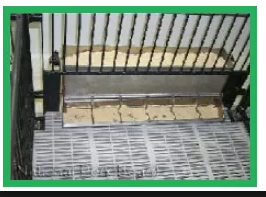 There are many factors that affect feed efficiency in production systems. These strategies to improving feed efficiency should always be evaluated with the ability to execute, and the effects on production system profitability. Understanding these impacts will help guide producers in decision making. If you have any questions, reach out to the Pipestone Grow Finish team at 507-825-7053. Scholtz is a graduate of South Dakota State University with a masters in swine nutrition. She is the research coordinator and handles the diet formulations for Pipestone Grow Finish.